Car batteries are not immortal. They are bound to fail at some point, and the manufacturer can only guarantee its functionality for a year or so. I bet you are here because you had an embarrassing experience of having to give your ride a manual boost with the help of a few strangers. I feel you! Imagine if those guys weren’t there when your car stalled? How would you push it? Your last resort would be a more expensive towing service! Here’s another truth about what happened. Before your battery died on you, something happened. You left the headlights on! Ha! Got you! With more than a decade of driving experience, there are a couple of times that I have left the headlights on. Don’t be too hard on yourself! It happens! Another scenario that may have led to your car battery trouble is that it has already reached its end of life and you have ignored the symptoms! Now, to be sure that you won’t be stuck with a dead battery again, a car battery charger will save you. You can easily buy a new battery if yours got drained. However, if it’s not at the end of its life yet, that would be an impractical choice. An d hey, a car battery charger can substantially extend the life of your battery beyond the manufacturer’s specifications. Here are some of the best car battery charger you can get your hands on to save you from these embarrassing moments. We put down a list just for you so that you don’t have to spend countless hours searching for the right car battery charger that suits your needs. Deltran Battery Tender® has been in the business for since 1965 and plans to stay in the market for decades more. They have been creating the best designs to match user needs without sacrificing functionality. They are manufacturing and ensuring that they have the best quality control to avoid factory defects and deliver durable electronic equipment. Today, they remain as one of the most trusted brands, and they focus on innovating to make sure that their gadgets are up to date and has the latest features. This battery charger is built tough and built to last. Its durable design ensures that you would have it for years and even the next generation will be able to use it. It has a temperature regulating chip that compensates according to the ambient temperature to deliver the right amount of voltage for fast charging. It has a reverse polarity protection that would keep you safe in case you tapped the wrong pole of the battery. It is rated at 1.25A charging, but the ambient temperature control helps it charge even faster than a 3A charger. You don’t have to worry about leaving your battery plugged because it has overcharge protection that switches to maintenance voltage when it is full. This charger works for all types of lead-acid batteries. This battery charger comes with clamps and terminal ring connectors. Works for all type of lead-acid batteries including AGM, GEL, and flooded batteries. It has built-in safety measures to protect you and the battery from reverse polarity damage. This charger automatically shuts down after 72 hours. Prevents over-charging and switches to maintenance mode when the battery is full. Their warranty policies are quite vague. Their after-sales services response rate is slow. Black + Decker is an American company known for their top-quality power tools since the beginning of the 1900s. With more than a hundred years in existence, they have become a top brand that manufactures durable tools and other electronics. Their length of existence is a testimony that speaks about their dedication to serving their clients and delivering durable power tools and consumer electronics. This portable car battery charger takes up very little space and charges your car battery just like a mobile phone! The charger is barely the size of the most common smartphones you can find in the market. It comes with battery terminal clips, rings, and an additional DC lighter plug. The plugs have quick connect functions that let you cycle between the different cables with ease. It can charge 6V and 12V lead-acid type batteries efficiently. In addition to wet batteries, this device can also recharge AGM and GEL batteries. This device has a safety feature that automatically switches to maintenance mode when the battery is fully charged. This battery charger is portable and easy to carry around. The clips, terminal rings, and DC plug have a quick connect attachments for convenient removal and attachment. Best for maintaining your battery charged when you are not using it. This product comes with a mounting bracket for easy wall attachment. Lacks LED indicators for different modes. The quality of build is not sturdy as the other prominent models. Schumacher Electric is an excellent brand of battery chargers that have a long list of models for different applications. They are known for manufacturing durable battery chargers, jump starters, power converters, testers, and other accessories related to batteries and other car electronics. They also manufacture chargers for motorized toys. Schumacher SE-4022 is a wheeled battery charger that weighs more than thirty pounds. It can charge 6V and 12V wet and other types of lead-acid batteries. It is a heavy-duty battery charger that is equipped with a cooling fan for efficient thermal regulation, especially for high amp applications. It’s a towering battery charger that has two dials in the top portion and a voltmeter to help you monitor how much charge your battery has. It has a built-in tester to help you see how much power your battery still has. It has a 200A setting that lets you jump-start a battery. The 40A setting rapidly charges your battery, and it also has a 10A fast charge mode. If you are not in a hurry, you can also use the 2A mode to recharge your battery. The float charging function makes sure that your battery will not be overcharged and you can leave it plugged to maintain the battery’s charge. It comes with a 6ft power cord, and it comes with 6ft cable clamps that give you 12ft range from the outlet to your battery. It has a built-in heavy-duty transformer that you can rely on. It comes with a 6ft long heavy-duty clamp. Built tough and meant to last a lifetime. Equipped with a cooling fan to prevent the machine from overheating. It has a jumpstart function to revive your dead battery. This device is not portable. Takes a large space in your shed. This battery charger costs a lot. Schumacher Electric Corporation has been on the market since 1947. They had a vision to exceed what their clients expect, and they did so. They are expert in the field of lead-acid and other types of batteries. They innovate and improve their designs every year to provide the best battery charger that every individual need. This portable battery charger is small but is packed with the necessary functions you need for your battery needs. This digital device has indicators and monitors in the front to let you know the status of your battery along with other function indicators. It has a 2A charging rate at 6V and a faster mode at 12A on 12V. It is equipped with a microprocessor that automatically adjusts the amperage for optimal and safe charging. This device also has a float mode to make sure that your battery is protected from overcharging. This is also useful during the off-season to maintain your battery charged without overcharging it. This device is a great choice for people who love automatic features and do not know much about the intricacies of electronics and battery charging. It automatically detects the voltage and amperage of your battery and adjusts accordingly. This device is portable and can be easily moved. It won’t take much space in your shed. This product is fully automated and adjusts the voltage and amperage depending on your battery. This charger comes from a known brand that manufactures top-notch devices. It has a float mode that maintains your battery’s charge during offseason without overcharging. This battery charger is a little expensive than most portable battery chargers. This is not the best digital battery charger on the market. To make sure that every person and every application is covered, Schumacher Electric Corporation has designed a large selection for the simple and heavy user. Their dedication to improvement and constant innovation have led them to develop state-of-the-art battery chargers that would make things a lot simpler and more convenient for every user. This battery charger is another portable model that operates on analog circuitry. It’s a classified as a handheld battery charger because of its small size but is packed with 50A of power that can jump-start your dead battery. It has a needle-type battery charge gauge that tells you how much power your battery has. It has three settings you could choose from depending on how you intend to use it. You can choose the 2A mode to slow charge your battery and make sure that it will not be damaged or choose the 10A mode for faster charging. For a dead battery that you need to revive, you can switch it to the 50A mode to give it a kick. It is equipped with LED indicators for easy monitoring and gauging your battery’s charge status. This product comes with heavy duty cables. You can jump start a vehicle with 50A using this handheld battery charger. It comes with heavy duty clamps. The internal components are housed in a heavy-duty enclosure. The unit is a little heavy for its size. Black + Decker is originally a manufacturer of power tools and has become one of the best in its field. They also manufactured other garage tools like battery chargers. Gradually, they expanded their production and manufactured consumer electronics. Today, they are still one of the best in the field of power tools and other garage electronics that you can trust. This product is a type of bench battery charger that sits perfectly on your bench top. It’s ruggedly designed to be tough and resist daily beating. This battery charger is packed in a black and orange housing that can be easily spotted in a cluttered garage. This automated battery charger has four function buttons and one charge button. You can jump-start a car with 40A using the engine start function. This product also features an automated alternator check to make sure that your car is charging your battery properly while it is running. It has a dedicated button for battery voltage check that allows you to view on the small LED screen the battery status. Lastly, it has a battery reconditioning function that dissolves sulfates to increase to restore battery’s optimum performance. This charger is fully automated and can be simply operated even without much knowledge about car battery and electronics. Features a 40A engine start function. This product is equipped with a battery reconditioning function. It has an alternator check function to make sure that your engine is charging your battery while you are running. This battery charger has a reverse polarity protection. It has a float mode that keeps your battery fully charged without the danger of overcharging. This battery charger is a little difficult to configure. Schumacher Electronics Corporation has revolutionized battery charging and has dominated the market for many years. They are consistently researching and reinventing to cater every individual need for different applications. With more than 70 years since its foundation, truly, they have mastered the art of designing and manufacturing battery chargers. This manual battery charger has a simple rectangular design. It has a needle-type meter that displays that status of your battery. With a switch, it can be manually set to 2A mode, 10A mode, and 50A mode. The 2A mode charges your battery slowly while the 10A mode can finish charging your battery in about five hours. The 50A mode revives your vehicle and gives it a quick start. This unit does not have automatic shut-off feature. It doesn’t have trickle and float/maintenance mode too. It is advised that you carefully monitor your battery status while using this charger. Manual chargers are built to last. It doesn’t have many parts that need to be maintained. It comes with cord clamps. This battery charger has an engine jump start function. This product does not have automated features and should be monitored to avoid overcharging your battery. During their early days, Black + Decker was known for their power tools. They progressed to other garage electronics and finally found their way in the kitchen too. As one of the top brands in the market, Black + Decker wants to make sure that they have the best battery charger with the highest quality rating. They design their chargers accordingly to accommodate different types of applications. This portable battery charger is famed for its waterproof feature. This is a handy feature for fishermen and other watercraft applications. This makes operating the charger on docks safe. This 6A battery charger can be used to recharge 12V wet, AGM, GEL, and other lead-acid type batteries. This model is a fully automatic unit that needs to be plugged and properly hooked up to your battery and your done. This battery charger has a built-in circuit protection that prevents overcharging and reverse polarity damage. The housing is built tough and is dust and waterproof. It comes with a DC plug and cable clamps. This battery charger is fully automated. It is water and dust proof which makes it ideal for watercraft. This battery charger is quite affordable. It has a low amperage setting and may not be advisable to be used on larger batteries. Gooloo is a proud manufacturer of functional and easy-to-use jumpstart kits that will save you a lot of trouble. They focused on designing a tough-built gadget that won’t take much space and can easily fit under your car seat or your survival bag. This ultra-portable device has a deceiving look. It’s small, and it can fit your hands. It’s quite heavy for its size and is packed with practical functions that you can use in your daily life. Gooloo revolutionized the idea of jump starters and incorporated features that are very useful for everyone. It can jump start a dead battery with up to 1000A at its peak performance! And when you don’t need it to jump-start a car, you can use it as a power bank! It can easily fit your bag and bring it along with you for that purpose. It has a built-in flashlight that can be useful during emergencies. Although this model is not meant to charge car batteries, the feature it has is worth mentioning and including in this review. If it only charges a car battery, maybe this thing is perfect! It 1000A peak power that can jump start even trucks! It’s portable and fits your glove box or easily stowed under the seat. This thing doubles as a power bank with 20800mAh capacity. It comes with durable jump start clamps. Doesn’t charge car batteries. However, your alternator can do that once you got your engine initialized. This product is a little expensive. CTEK, since its establishment, had envisioned maximizing the performance of batteries. Battery manufacturers already aim to give clients satisfaction. However, for CTEK, these car batteries are not maximized. Therefore, they aim to push the bounds of battery charging technology to its limits. This handy battery charger can revive 12V batteries with 4.3A of power. It is compatible with most lead-acid type batteries, AGM, GEL, and other batteries. This device is fully automated and only needs to be plugged and hooked up to your battery. It has two indicator lights that show that your charger is powered and a fault indicator. This automated charger employs an 8-step procedure to recharge your battery. It starts with desulfating the batteries to make sure that it is in top shape. It is followed by a soft start that makes sure that the integrity of the battery is intact. It proceeds to bulk charging to fill your battery. The next phase is absorption. The battery is then charged up to 100%. When the battery reaches 100% charge, the charger proceeds to the analysis phase to make sure that the battery can hold 100% charge. The next stage will be reconditioning the battery if there is a need. If it’s not needed, the charger will continue with the float charging. Float charging is a smart charging technology that monitors the level of your battery’s charge. It gives just the right amount of input to keep the level at 100%. This system prevents overcharging the battery. The last stage is pulse charging. This maintains the level of your battery’s charge to prolong its life. This device is very small and portable. It employs an 8-step charging process to charge your battery and maintain it. It has a reverse polarity and circuit safety features to protect your car from damage. It has a float charge mode to maintain your battery during the off-season. This device is dust and water resistant. The best car battery charger varies greatly depending on how you use it. Especially today, battery chargers are evolving and starting to be integrated with other useful safety features. Determining how you plan to use it will save you a lot and will lead you to the most useful feature that fits your activities. If this buy is related to your business or profession, the toughest out there is your perfect choice. This may cost a lot more than the designs intended for hobbyists. Here are some other useful features that you want your car battery charger to have. In the event that you accidentally hooked up the battery’s polarity in reverse, your battery might explode or may damage it permanently. When a battery is a reverse polarity damaged, it may not be able to hold a permanent charge. To avoid this, battery manufacturers have devised a safety feature that prevents this problem. You need to plug the battery charger with reverse polarity protection on your mains first before hooking up the battery for this to work. The size of battery charger matters. Actually, this may be a matter of preference. However, the bigger models are usually tougher and built to last compared with the ultra-portable versions. However, the portable versions are easier carry around especially if you would need it to bring the charger to the docks. Now, depending on your intended use, you may want the portable version or the bulky manual versions. Automated battery chargers are getting popular because of their ease of use. It is very easy to use and would not require an in-depth knowledge of batteries and electronics! Just simply plug it to your mains and hook it up to the battery. Most automated units have 4, 6, or 8 steps of charging that evaluate the status of your battery and charge it until its full. They often offer float charging modes that keep your battery charged at 100% without the risk of overcharging them! Unlike manual battery chargers, you can leave this unit for months without worrying about your battery. Watercrafts also have batteries that need to be charged. Water resistant chargers are a great choice for fisherman or hobbyists playing with water. Water resistant chargers are a great choice to maintain batteries at the docks during the off-season. Not all battery chargers are programmed to jump-start a stalled vehicle. This is a nice feature that can save you time and would make a lot of stuff more convenient. This will jump start you to get you to the nearest service center. This mode is what you would really want to have if you will plan on maintaining your battery for long periods or during the off-season. Naturally, the battery will slowly discharge over time. Float mode constantly monitors how much juice is discharged from your battery and charges it a little to maintain your battery at 100%. If you accidentally left your headlights on last night, surely, your car won’t start! If this happened at your someone else’s house, you would probably have to gather a few men to give your car a boost! If only you have the best battery charger at your disposal, you wouldn’t be in this difficult mess! A battery charger will keep your battery in top shape. A well-maintained battery would not easily give-up on you and would have a longer life-span. Even longer than what the manufacturer recommends! If only Gooloo’s GP200 can charge up your car battery, then it would be the best! Still, this is the best jump start kit that doubles as a power bank. In fact, you could have it mainly as a power bank and use it as an emergency jump starter! For professional use, Schumacher SE-4022 is your best choice. It is built tough and built to last. It has modifiable settings that can jump start even a truck! 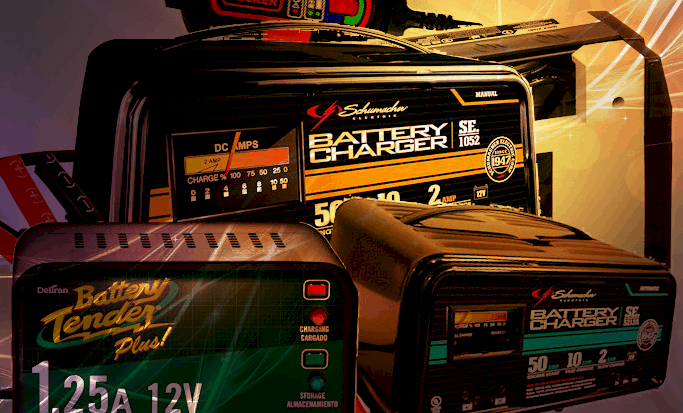 This is the most reliable battery charger that you can use in your shop! Now, if you want the best among the rest, you would have to spend a bit. CTEK’s fully automated battery charger is what you are looking for. It’s portable, and it follows an 8-step phase to make sure that your battery is reconditioned, fully charged, and well-maintained. For the extra bucks, this product is superb.